Greetings from one of the coldest inhabited places on Earth...Chicago! It was -21 degrees at 8 this morning when I took my wife to work (I'm not doing anything) with wind chills at -50 degrees +. Tomorrow we may get to 0. School was closed Monday (due to 7 inches of snow Sunday night), today, and maybe tomorrow. Lots of businesses are closed. In some places the USPS will deny their old slogan even existed. It's not pleasant out there. It's been a while since I posted, but I'll put a quickie one up here now. We need some heat on this really cold day...it's the Gold Minted pack from 2018 Topps Fire! 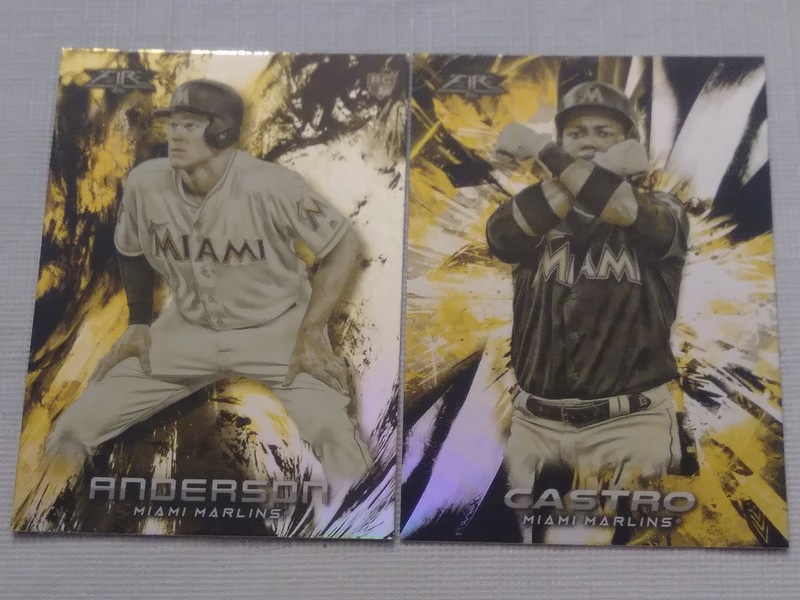 It's what you expect...it's Topps Fire, but gold....GGGGGOOOOOOLLLLLLDDDDDDD!!!!!!!!!! He wasn't too pleased with the 2 Marlins, but he at least recognized Castro as a former Cub. Here are the backs because GGGGGOOOOOOLLLLLLDDDDDDD!!!!!!!!!! OK, that's the pack. More later eventually. Stay warm my friends! That pack started out pretty hot, but ended on the not so hot side. -20? That's just insane. Can't even begin to imagine these temperatures. Keep warm. 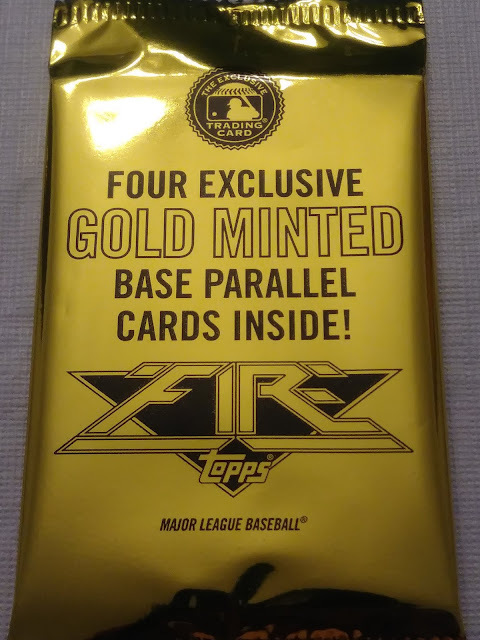 Not a fan of the Topps Fire baseball. These gold versions don't change my thinking any. That said I wouldn't mind seeing these in hand. This is the first I've seen them. 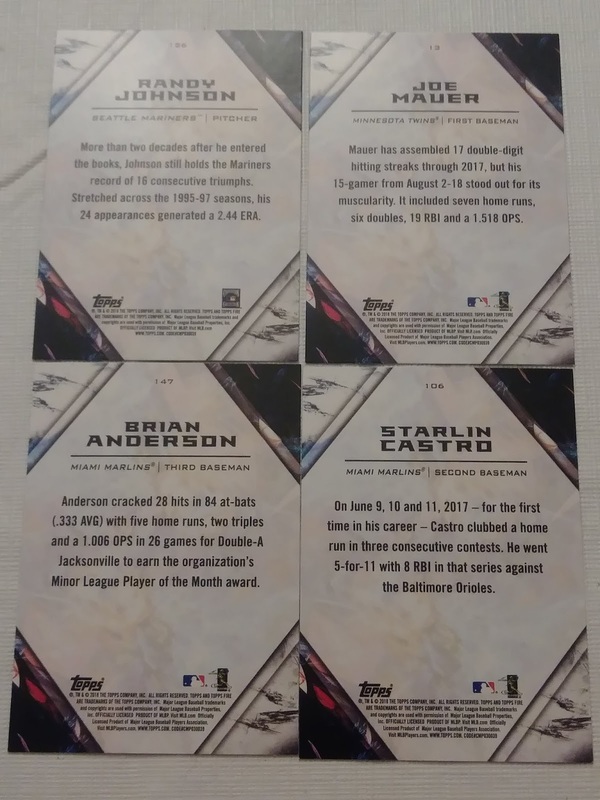 Good post and the Johnson and Mauer are good pulls. I only purchased fat packs of 2018 Fire so I never saw these Gold Minted cards. 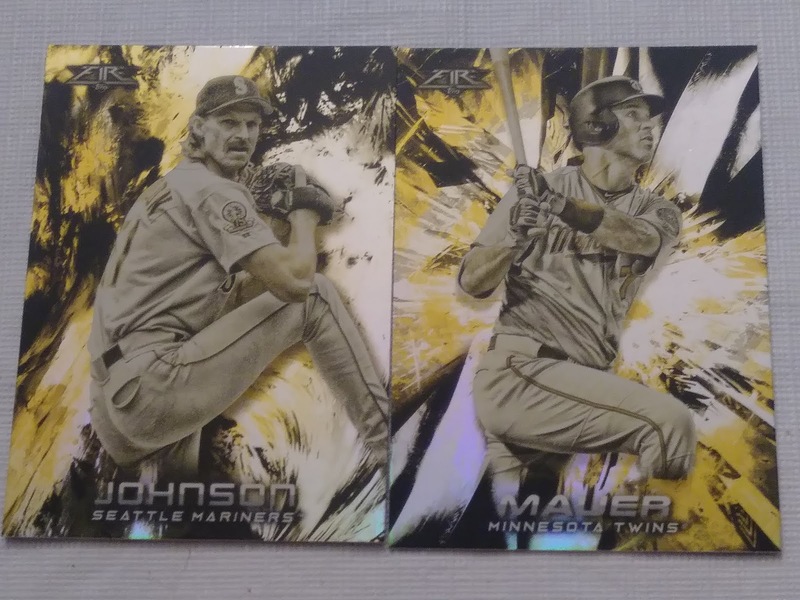 Meh...I like the Blue Chip parallels better.